Some people believe that God allows Satan to tempt them. If we are Christians, I believe God doesn’t allow Satan to tempt us, as He did in Job’s case, but protects us by the blood of his Son, Jesus Christ. But does Satan need to tempt us? As the bumper sticker says We seem to do a pretty good job of tempting ourselves. And for this reason, Christians are often no different than any other ‘Joe’ or ‘Joanna’ we may see on the street. But if we truly believe that Jesus is the Son of God and who God is, temptation shouldn’t be the problem we make it out to be. But has Christ given you, even a plural you, the strength all the time? Instead of relying on ourselves, our friends, or even our churches, I argue that when the problem is too big for human means (or even when it is not) we should rely first and foremost on our God. Instead of Fighting, fleeing, or failing to notice that Satan is simply doing his job in our society, there are at least three proven strategies that work. 1. Believe that God is bigger than anything we may come up against. 2. Cheer up because you are not alone in your struggles. As we enter a new year, having faith in our God, taking heart in our current situation and praying for ourselves and our friends are three New Year’s resolutions I intend and hope to keep. The following is my prayer for my new year. Though I didn’t write it, I will gladly join in. Feel free to join me, wherever you may be reading this at the moment, having faith that God is listening to your prayer. and seek your direction and guidance. We have ridiculed the absolute faith of your Word and called it ‘pluralism’. We have worshipped other gods and called it ‘multiculturalism’. We have endorsed perversion and called it ‘alternate lifestyle’. We have exploited the poor and called it ‘lottery’. we have shot abortionists and called it ‘justifiable’. We have neglected to discipline our children and called it ‘building self-esteem’. We have abused power and called it ‘politics’. We have coveted our neighbor’s possessions and called it ‘ambition’. We’ve ridiculed the tine-honored values of our forefathers and called it ‘enlightenment’. Search us Oh God and know our hearts today. to the centre of your will. I will never forget the next night. As I heard another few hammer-whacks pounding nails into flesh and wood, and the agonizing cries that immediately followed, I began to see life, or rather death, from their point of view. It was just a matter of time when that would be me, and time was ticking. When I was free, I remember seeing their crosses on the roadside. It scares me half to death when I hear them groan. evenings, people were in their homes getting ready for the coming meal, but tonight I could hear the faint murmur of a distant, angry mob shouting my name. My ears perked up. After a short hush, I heard the mob shout even louder, “Crucify Him, Crucify Him!” I guess tonight is my night to join those other criminals on the crosses outside, and my hope of having a new room mate, has run out. But wait . . . the doors were opening . . . ‘who’s the new criminal?’ . . . But there was none. Just a couple of guards walking purposefully in my direction! As they led me through the streets to the waiting crowd, protesting outside Pilate’s house, my knees shook and buckled as I expected the worst. But nothing came. This gruff form of mercy was something I had never felt before. Maybe I’ll get to see the city one last time before hanging from a cross. Is this Jesus the same person Matt was talking about? The man who can heal from a distance? As I looked up, I saw the man I thought was Jesus. Wearing a crown of thorns on his head, he had marks from his most recent scourging showing through the purple garment he was wearing, down to his bare feet. He was being led away by several guards who took turns mocking him, hitting him with their staffs on his thorny crown, chanting “hail, king of the Jews!” And this ‘king of the Jews’ would die instead of me? This didn’t make sense. Night time is usually the best time to rob people, but I would set my job aside for one night to watch this fascinating plot unfold. Pilate decided that the crucifixion would take place on scull hill, a place where I had been many times to say my last good byes to some of my closest friends. And if I had time, I would have asked Judas and Matt to come along with me. But who knows, maybe they were in the crowd. 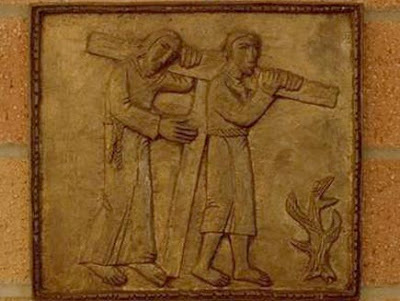 It took a good hour to make it to the top as Jesus, whom they referred to as ‘the Christ turned criminal’, who was carrying his cross, was in no rush to be nailed to it. I was somewhere in the middle; hearing jeers from Harassees and other men, weeping from women pleading for his release and hungry, tired children, who didn’t want to be there at all. Though there was hardly any room for a passing lane, a man running towards us attempted to do just that. Late for dinner I suspect. But the Harassees denied him safe passage and demanded that he carry Jesus’ cross back up Skull hill, as he had collapsed under its weight and didn’t have the energy to rise without help. If there was anyone who deserved to carry a cross, this cross, it was me. I could feel a tear running down my cheek because I could not give him the help he needed. He was taking my place, after all.